Wood drapery rods. Use as swag curtain rod. Modern curtain rods. Kirsch's reputation for quality and elegance was built on Wood Trends. These classic styles in rich colors and subtle grains complement wood furniture finishes and architectural details, allowing for a totally original design statement. With a wide assortment of components such as elbow brackets, swivel sockets and holdbacks, Wood Trends is not only timely but also functional. Bright brass finish, projects 3 1/2 to 4 1/2 inches, clearance 2 1/2 to 3 1/2 inches. Rods are metal, slides and finials are plastic. Extra slides available sku 1-428. 1 1/2 inch Elegance II. drapery hardware collection by Graber. Truck shipping only on this item. Cornice Ceiling Mount Brackets Yes, we even have brackets to mount cornice boards to the ceiling! Concealed special bracket is made for cornice using 1x2 lumber at the top. Easy and adjustable for carefree installation. A commitment to quality. Valance curtain bracket for ceiling mount. Our commitment to quality is steeped in tradition. Whether it's inspiration you seek or innovation you crave, energize your creative spirit with the drapery hardware collection by Graber . Zinc chromate finish. 8 foot twisted 1 inch metal curtain rod. Priced each. Looks like wrought iron drapery rods. Electric Curtains made possible with this quality motor and track system. It is available in widths up to 16 feet in one piece, and wider by splicing the track. One way and center draws available, control selections available. A Ripplefold option is also avilable. For pinch pleat draperies. Uses the Glystro 25 RTS motor. This drapery rod motor available up to 192 inches wide with a weight limitation of 70 pounds. Price includes track, 15 feet of cord and transformer.Transmitters, switches and timer available. Easy installation, smooth and quiet operation, manual override system, flexible control options, robust capacity and simple to program. 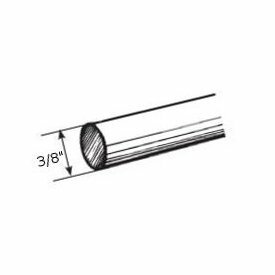 HD27104P: Decorative curtain rods , smooth rod, plain slides 38"-66"
Barrel Brackets for Round Curtain Rods Barrel brackets for 3/8" round rods are available in different projection sizes. This one has a 1" clearance, has a brass finish and is made of metal. Price break, 10 pair. Brass finish. Basic Traverse Rods for light weight draperies. Regular duty. White finish. For ceiling drapery rods, end brackets are not necessary. You can mount the rod directly to the ceiling. Stirrup support may be needed for wide curtain rods. by Graber, and with BasicQ policy, you can save on 6 each or more. This traverse rod can be used as a one-way right or one-way left by moving the master carrier. Standard, one-way right. This is a test item for creating savings based on ordering all the components necessary to make a complete wood rod set. Order all components from one item menu to insure you get the right finial, bracket, rings and wood curtain rod that match in style and color. Save over 25 percent on combination! Drapery pins of every style and pin setters to make the installation easy. Pin on drapery hooks, 3"
Curtain rod brackets to extend the projection. Slides are designed to fit certain profiles of track. When ordering replacements, it is important to know what type of track you have. Does the slides come out of the track from the bottom, or does it come from the back? Is it for standard pinch pleat draperies or ripplefold? You also need to know the size of the track and the width of the open slot where the slides run. Some slides are made with a formed piece of vinyl while others have wheels. The wheeled slides can be fixed axle or ball bearing. I have listed several types of slides below. There are over 250 listed at the link, and many more available in the market for different brand traverse rods. Hotels, hospitals and commercial buildings use these to replace missing or broken parts to protect their investment in the draperies that hang from the traverse or curtain rod. With all of the lecturing done, many tracks use the same slides, so selecting is not as difficult as it first seems. Consult your supplier if you are not sure what type you need. Just a few examples of what is available for wrought iron curtain rods. Many instruction for installing Kirsch drapery hardware can be found here. The files are PDF format for easy downloading or viewing. Instructions packed with the Graber arch window curtain rods. Some of the options available for covering arch, eyebrow, circular and other specialty shaped windows. Arch top clear curtain rods 28-40"
Arch top curtain rods, plus oval, octagon and circular windows kit to 92"
Arch top window curtain rod clear 28"48"
Arch top curved window curtain rods clear 48" to 86"
If you need wide traverse rods, Kirsch has them, including this one that goes to 300". Wider rods are available in other models. Some can be designed to cover over forty feet of space. Two way draw, or center opening. Hardware brackets, drop in, supports and tension pulleys are included on this curtain rod. Truck shipping only.